We would like to inform you of the recent experience we had with our six year old Dobermann dog following his Booster. 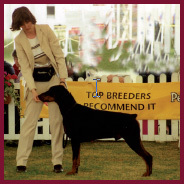 Tommy was in excellent condition and was a Champion showdog who was Top Dobermann in the UK 2000. In May 2002 we took Tommy to the Vet for blood tests to see whether he needed his Booster and the Vet advised we should give the Leptospirosis vaccine as this was safe and would definitely be needed. On his return home, Tommy was very quiet and went and lay upstairs on his own. When we tried to get him to come downstairs, he had problems getting up off the bed and was unco-ordinated. He then tried to get on the bed in the other bedroom and when we tried to help him, he fell back screaming in pain and could not move. We immediately took him to the vets who kept him in for the day on a drip saying he had inflammation of his entire body and this was a known reaction to the vaccine. He seemed much better by the evening so they said we could bring him home but he deteriorated again, collapsed on his back end, wedged under the furniture and was screaming in pain. We rang the emergency Vets who said to rest him and give him metacam. We sat with Tommy throughout the night and we got the Vet out first thing Saturday (the next morning) and he was given morphine and carried out in a blanket to be returned to the Vets. Over the next few days a myleogram was done and the pictures sent to a specialist and surgery was performed on the following Tuesday. One of Tommy's discs in the pelvic region had completely blown apart and there was massive hemorrhaging. The surgeon said he had never seen anything like it. Over the weeks and with physiotherapy, acupuncture and swimming Tommy had improved and was standing and sitting and seemed to be making a slow but constant recovery. Tommy stayed at a specialist Vets in Fleet, where he was swum every day and the treatment could not have been better. We then started to bring him home weekends and had him home for the last week with his daughter Leila, taking him back for swims every day. Throughout this time, Tommy was always in high spirits and was getting up onto his feet and attempting to move. Unfortunately, over the last week, he started to deteriorate and was becoming less able to get around. We arranged for a consult with the surgeon on 1st August (unfortunately his 7th Birthday) and it became apparent after various tests that his nerve damage on the left side was too extensive and he would never be able to progress any further. We then had to make the terrible decision to let him go and not prolong the situation. Tommy had been a wonderful patient endearing himself to all who met him and his willpower had been phenomenal. He will be sadly missed. We were told that every drug reaction should be reported to the Veterinary Drug Board (Veterinary Medicines Directorate) and even if your vet doesn’t, you can yourself. After insisting on same, the vets reported the reaction to the Veterinary Drug Board (Veterinary Medicines Directorate) who wrote back acknowledging it was a known reaction with the Leptospirosis vaccine. Tommy’s history was at least logged as an acknowledged reaction which we hope will stop another animal having to go through the same trauma. Because of Tommy’s successful show career, his loss was published in the dog press and we were overwhelmed by the amount of people contacting us from all over the world with similar reactions to vaccines. We still, nine years later, get correspondence from dog owners whose pets have either had long term health problems or died as a result of their vaccines/boosters. We can only hope, that by telling people about our experience, dog owners can at least make a more informed decision. We only wish that we had been aware of the known problems with boosters and we would, therefore, not have made the same fateful trip to the Vet for what was supposed to be a routine appointment but what turned out to be the most traumatic set of events. Catherine O’Driscoll from Canine Health Concern lost dogs from boosters and now has a website covering the problems with vaccines.